Chamonix - Our first year! So we did it, we moved to Chamonix! After a couple of years planning and at least one year fretting, here we are, 1 year (well 18 months) later! It’s been the best year and the best decision we ever made! Bubba the cat has different feelings about the move to Chamonix. Turns out snow (and the big moggy upstairs!) wasn't what he had in mind. One of our clients Anna has decided (well the ballot decided really!) 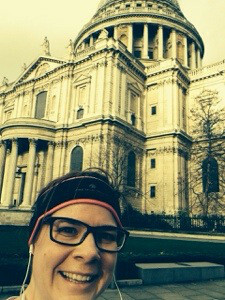 to run the London Marathon in April 2014. We will be working with her to train the core, strength, endurance, power, balance intervals, fartlek and the occasional rehab session. She will do runs small and large outside our sessions together. Here she will keep updates of her experiences, how she is feeling and how she deals with the inevitable challenges. New posts appear at the top so head to the bottom and read up! It’s been a good week. 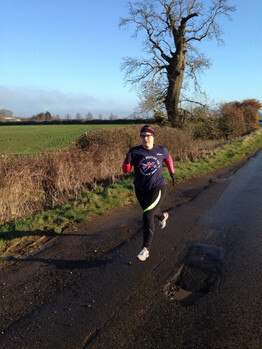 4 fantastic runs in the bag and managed to stick to my marathon training plan too – and actually exceeded it a little. Who’d have thought it! Down past Oxford Circus, Regents Street, Duke of York steps, Whitehall, Big Ben then along the embankment. I passed the Tower Lifeboat station and continued to St Pauls… And just as I got to St Pauls, I checked my Garmin and I was at 10 miles. I was rather overwhelmed and got stupidly emotional. I never thought I’d be able to run 10miles again after my knee problems in 2008. Shows that time does heal. I carried on around the city and finished at Moorgate where I got the tube home. So did somewhere between 11 and 12miles all together in exactly 2hrs. But my pace was so jumpy – somewhere in between 8,46mm and 11,24mm… I need some help to get that right! However, so so proud of myself. Now I’m busy cooking a roast chicken and I have a date tonight with my foam roller and maybe deep heat!!!! Tomorrow is a big fat rest day and I can’t wait. 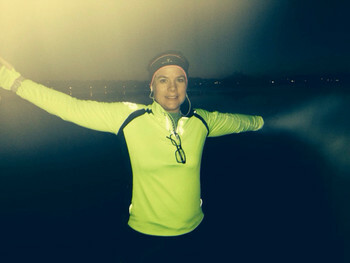 I ventured out this morning at 630am and covered somewhere between 4 and 5 miles (Garmin took a while to wake up!). And it was just the best run I’ve done. I had loads of energy, and really enjoyed it. And when i got to work, I was a happy person – full of beans! I was hoping that I’d enjoy it after my disaster on Sunday (didn’t manage even half of planned distance) … onwards and upwards. I’m going to do another run early doors tomorrow (then have an all day meeting so need the fresh air pre work). I’m hoping for another peaceful, beautiful morning. I’ve had a good week up to now. I recovered with few aches and pains from my Sunday long run. Monday had a good PT session – but didn’t have much energy. 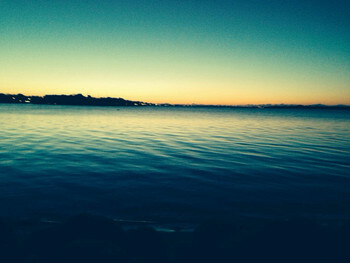 Tuesday was rest day and yesterday ‘enjoyed’ and early morning jog along the sea front in Poole. I managed to persuade a friend/colleague to join – then surprised her with ‘I want a picture for my blog!’. See below. It was such a beautiful morning as the sun rose, little wind for the first half, massive headwind coming back. And I did get a horrific stitch. I need to sort that out. I’m going to try 5 miles tonight on my way home – then intervals tomorrow. 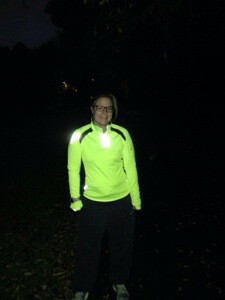 And gearing up for 9-10 miles on Sunday… Relentless and tiring me out!!! 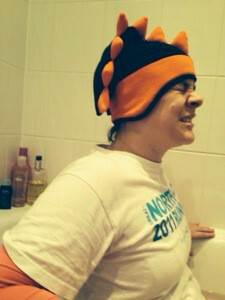 I then went home, had a necessary ice bath, screamed lots. And now I’m getting ready to head out for a mean Sunday Roast. Super proud of myself for sure. I’ve had a good week so far since the last entry. 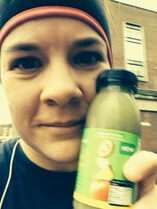 Thursday morning I ran to work and it felt good – apart from puking up my espresso and banana half way! Sorry to everyone walking into the tube at Highbury! At that point, heart was saying ‘get the tube’ but head said ‘carry on’! I walked a little then carried on running through the city. So I think about 6miles run. Pretty good me thinks! 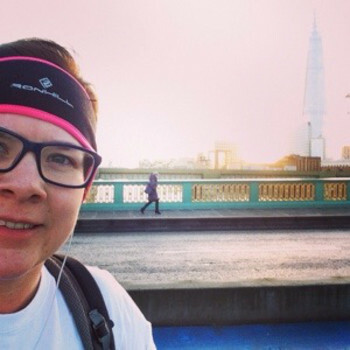 Lovely pic of me going over Southwalk Bridge with the Shard in the background! Yesterday was rest day and this morning by husband came out for a (nearly!) 5k. Not sure I’m a good running partner as I like to moan quite a bit and subsequently love the attention when I moan! I treated myself to a smoothie afterwards. It was raining quite heavily and my feet were pretty wet! Smiles all round though when it was over! 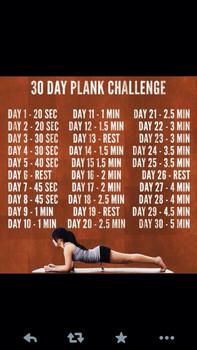 And from tomorrow, I’m doing the Plank Challenge with some twitter pals. Anyone else up for it? I’ve done 2 runs since my last post. 7.5k on Sunday and a good 5k today. 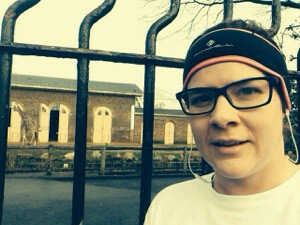 Tomorrow I’m planning on doing the Ally Pally Park Run! We’ll see how my hangover is! But I hope to be there at 10am. I’m definitely feeling stronger every day and looking forward to following my running plan that’ll get me over the finish line in April. Happy new year to all my followers. I hope 2014 brings you great things. If I make it tomorrow morning, I’ll post a picture! Tomorrow I’ll try a short run again. But it’s so hard what with all the eating and drinking! Beautiful run just now. But think the alcohol last night didn’t help one bit… Made me think that I should go dry from 6 Jan till marathon day. Any thoughts or advice on that? So, whilst most are getting super excited about finishing work for Christmas, I’m getting super stressed about the amount I HAVE to run over Christmas!!! If my marathon quest is to be a successful one, then I have to put the time in over the next 2 weeks… And I have to believe its possible too – and believe from my heart. Saying that I’m currently sat on an East Coast train from KX to Leeds and have just drunk a bottle of Champagne! Running a marathon seems so far off! So I have 2hrs on a train and now is the time to plan. And I must stick to my plan as I have no one to keep tabs on me. Damian, my PT, is off snowboarding for a couple if weeks. I’m not jealous, much! So, I don’t have him to motivate (or check up on) me! I’m on my own. Crap! It’s hard to run when I’m at Mums. Warm house. Good food. Gin practically on tap. And I hate hills. Whenever I see one, I walk. And Mum lives in a valley! I’m screwed!! So, I’m mentally preparing. And I need to put in a few runs before I go home on Christmas Eve. I’m going to put in a run tomorrow around Roundhay Park. And Sunday I’ll do a long run home from Kings Cross. (I’m hoping my husband will take my bag home, please Dave?!). I’m aiming for 7-8 miles. One thing probably more important than running over the break, is that I need to make friends with my foam roller again! My aim is once a day for calfs, quads and ITB. So, when I return to the smoke after Christmas, I’ll have done at least 4 runs, and will have spent at least 10 mins a day on the roller. There’s no point talking about nutrition… Clean eating starts again on 6 Jan!!! So this week has been a total write off. I was struck down by an awful chest infection last weekend which has meant no running for a whole week. That coupled with currently being in Munich for the Christmas markets, means I need to massively make time for running this week!!! I have some catching up to do! I’m planning to do a run tomorrow evening when I get back from Germany, Tuesday morning before work and I have PT on Thursday and Friday. Then I’m on my own over Christmas. Let’s see how disciplined I can be as Damian is off playing in the snow with his snowboard! I’m hoping to stick to the three runs a week along with a long weekend run. Christmas is always the hardest time to run what with all the food and drink around… I’m going to try really hard I promise! 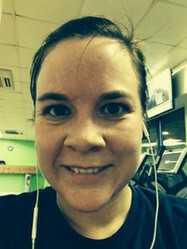 So, I have had a great couple of PT sessions this week and had a good, short midweek run on my own. Picture below is of my doing some exercising in the park. 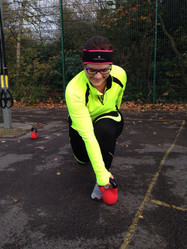 One PT session had far too many squats and lunges in – and after intervals too! My glutes were screaming afterwards! No pain no gain as they say. Then tomorrow it’ll be a 7-8miler. I’ll have to do it first thing so I don’t think about it too much. Does anyone else have off days? Or is it just me? My interval session on Tuesday was fab. Really ‘enjoyed’ it (never thought I’d say that). Then work has gone bonkers so not much time or energy to get the running in. Note to self, I must book in time with myself to run. That’s the plan anyway. I’m in Somerset for the weekend and had a lovely early morning run today. And my husband came with me too which was great. I loved the company. However, I decided fell running would be fun and had a fight with a thistle bush. And the thistles won so i now have a rather cut up leg! Savlon and plasters at the ready. When I say long, I mean 5 miles. And that’s long for someone that hasn’t run properly for years! And it was pretty much 10m miles too. And it felt good. And I felt strong. Apart from the numerous stitches, feeling a little pukey and really needing the loo. So after I finished, I indulged in a foul recovery protein shake. Good for me apparently (or so Damian says!). That or an egg?! All I really wanted was a Mars bar. I’ll save that for my next long run! 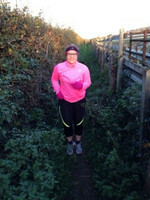 This week I have an interval session on Tuesday, a run on Thurs and a long run on Sat morning in Somerset. So, I’m glad to report that the intervals were good. Verging on fun. But they were pretty exhausting, not least because it was 630 am! After a quick warm up, Damian and I cracked on with a number of short 7/10 effort sprints and finished with 2 x 10/10 effort sprints. It’s definitely a good way to wake up in the morning. However, next time I will have a quick espresso beforehand! Picture below is proof!! High vis galore. That evening I went to the lovely ice rink at Somerset House. Had loads of fun – but it did mean the next morning I didn’t just have sore legs from the running, but I also had sore arms from the repetitive grabbing onto the side to keep me upright! Aiming for a 5 miler tomorrow. Wish me luck! So, I’m realising that I need to conquer a blister problem. Firstly, last week I got one under the arch of my foot. And now I have a corker on my heel. Do I pop or do I sit it out and let it heal? I’m hoping that all the necessary skin will harden over time… Nice topic of discussion eh? Thoughts? So I ran yesterday and today. Just for 30 minutes each – but it’s all about getting back into it. I found it quite easy mentally but physically terrible. So terrible today I got a stitch after 1 min, totally ran out of puff and I had to use my Oyster card and get the bus up the hill!!!! But I guess I’m only a week into training and maybe I’m expecting too much too soon. PT session tomorrow then interval training on Thursday… Oh heck what have I let myself in for? Intervals. At 630am. Thursday morning. I’m going to be knackered!!! Coffee on tap?! So, today is going to be a day filled of fun. Firstly, I’ve been out and bought a new pair of trainers. These will be my marathon trainers. Quite a good looking pair of trainers – come April, I’m sure they will look different! Thirdly, no run today! I ran yesterday and had a PT session so every bit of me hurts. Legs, bum, stomach muscles. So I’m glad there is no run! But I’ll be planning my route for tomorrow. I’m thinking a nice route around ally pally. Then a nice Sunday Roast as a reward. There seems to be a pattern here. Rewards. So what should be my reward in April? I’ll get thinking. And when I say Day 1, I’ve definitely been thinking about it for a while (like months), but I’ve struggled mentally to get to Day 1. But today was Day 1. 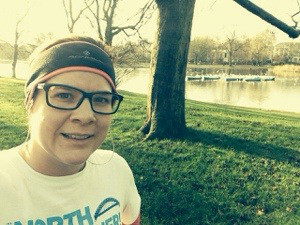 I went for a run, my first run in months – and I now consider that I’m on my journey to the London Marathon in April 2014. Back in 2008 (those that knew me then) would probably ask ‘why again’? For those that don’t know, I endured a horrific injury in my knee the week before the marathon but stupidly did it anyway. 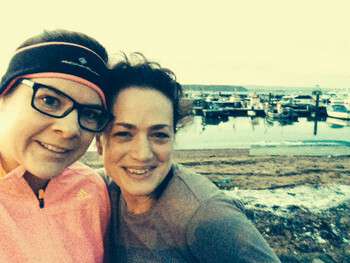 And needed physio for a whole year to sort me out… And haven’t run properly since. So I was terrified when I got a ballot place… There wasn’t even a bit of excitement – I’ve always thought I had something to prove to myself, but never in a million years thought if be one of the lucky ones! This year is different to 2008. I’m married for starters (yay!). I’m also a bit older, not as fit and about a stone (or 2!) heavier! So the challenge is so much greater. I’ve also been mentally struggling with the get-go. 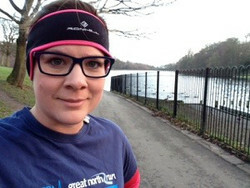 I know what it takes to run a marathon and I’ve been questioning whether I’ve got it. I’ve been seeing a personal trainer, Damian, for a while now. He helped me get in shape for the wedding, and now he’s promised to help me achieve my dreams by training with me (and pushing me hard I’m sure) until I get to that start line Blackheath in April. Then the 26.2 miles is down to me and only me. And when you are all enjoying a nice Sunday in the warm (over the next few months) – think of me pounding the London streets, training hard so I can achieve my dream. I’ll be fundraising (of course that’s what I do for a living!) and this time, it means something to me… I’ll post about it sometime (when I’ve set up my donation page). But let’s just say, I’ll be running in memory of Dad. Someone who has played such a massive part in my life and someone who I think about every day. Miss you Dad and I promise I’ll get to The Mall for you in April. 1) Drink Green Tea - Green Tea raises the metabolic rate inducing thermogenesis which stimulates fat oxidation. 2) Avoid Simple Carbohydrates - Simple carbohydrates are metabolised quickly causing an insulin surge, leading to fat gain. 3) Avoid Sugar - Sugar is a type of carbohydrate, it is also very addictive and in huge supply in processed foods. In addition whilst your aim is weight loss, avoid fruit. 4) Cut Down on the Booze - An obvious one this, but alcohol is full of calories, especially the sweet drinks like cider. If you do drink, opt for lower volume (spirits) with low calorie mixers such as Gin & Slim. 5) Take Omega 3's - Omega 3 oil will help flow blood to your muscular system. Whilst exercising this will help stimulate enzymes to transport fat for use as energy. 6) Eat More Regularly - Eat 6 smaller meals consisting of protein (meats/fish/eggs) and green vegetables to keep your metabolism stoked! Eat every 3 hours. 7) Drink Plenty of Water - As well as umpteen health benefits, drinking enough water helps the process of burning calories whilst being dehydrated will slow down fat burning. Aim for around 2.5 litres of water per day. Avoid sugary drinks like fizzy drinks, squash, juice and smoothies. 8) Supplement with L-Carnitine - The fat metaboliser. Liquid 1500 form is particularly effective at metabolising fat, especially around the belly. 9) Get Plenty of Sleep - You body needs enough rest to be able to function, its also vital for muscle development. A lack of sleep releases the fat promoting hormone Cortisol. Get to bed! 10) Take the Stairs - Okay well this is sort of exercise but it's free and you can incorporate it in to your daily commute or life. Ditch the lift and escalator and use those pins that god gave you, thats what they are for! Please remember though, exercise is important and will be the cornerstone of any weight loss regime. This tip list will work ideally combined with a structured exercise programme. If you are already exercising, add these fat loss strategies to your daily life. If you are not exercising, get started with these tips and start thinking about adding exercise. If you are badly out of shape start light, even just walking, and build up. Help Blast Away Unwated Fat. One supplement we are really keen on to help metabolise stubborn fat tissue is L-Carnitine. Carnitine is an Amino Acid, it is particularly effective at shifting visceral fat, that is the dangerous fatty tissue that sits around your abdominal organs. We suggest clients take around half an hour before exercise to see maximum benefits. Fitness training can mean may things to different people. Of course hiring a fitness trainer would mean you can brief them to plan and carry out specific functional fitness programmes to suit your needs. For the purpose of this plan we will class Fitness training as "exercise carried out to feel better and healthier whilst having more energy"
If your goal is simply to get fit and you plan to do it by yourself our fitness training guide will get you on your way. The fitness training activity you do needs to raise your heart rate. The most effective and fun way of achieving this is via the following fitness plan. This plan is meant for people who are a little out of shape but are not new to exercise. Sugar and it's Secret Sisters! We all know that sugar is making us fat and is best avoided. With our over-reliance on produced processed foods it's important to be empowered to make the right decisions or at the very least be conscious of the decisions we make. A great rule of thumb is simply to always check the label. If there is an ingredients label then its a processed food, no matter how healthy you may deem the product to be. So you have done loads of hard work, your diets been clean, you have avoided carbs and sugars. You have hit the gym hard, spent hours doing as your Personal Trainer has told you. More squats than you care to imagine. So you should see this reflected on the scales right? Not necessarily. You see muscle weighs more than fat. Weight training is the cornerstone of any good weightloss programme. Sure some cardio has its place, but the days of the cardio bunny are over. To burn fat we need to increase muscle. Don’t worry ladies you aren’t going to suddenly turn into Arnie with huge rippling muscles because you don’t have the right hormone makeup for this. So whilst the scales have their place, don’t get hung up on numbers. Take some before and after photographs or chronicle your photos weekly. The best measure we feel is the mirror, how you feel, how clothes fit and if you want to be a little more scientific body fat, preferably using body fat skinfold calipers. How to Lose Weight – Get Rid of the Belly Fat! Counter this with eating good clean sources of protein and vegetables. Nuts and seeds make a great healthy snacks, avoid the dried fruits though! If you want to lose weight and get rid of that unwanted fat, the good news is long tedious cardio is not for you. What you need to do instead is raise your heart rate and lift weights. Hormones play a key role in your body composition, weight or fat loss and your general sense of wellbeing. Exercise and nutrition can play a pivotal part in balancing your hormones but other factors matter also. Stress and a lack of proper sleep are the main things that undermine weight loss. If you aren’t getting enough, get more! If your sleep is broken, try adding a Magnesium supplement to your diet. There are also magnesium bath salts which will help relax you for a better nights sleep. Obviously this is just a snapshot of the areas needed to be considered for weight loss. Look out for articles where we go in to more depth on each. Currently we are only taking new bookings in the Crouch End, N8, Muswell Hill, N10, and Highgate, N6 areas due to limited availability. Get in touch to discuss. 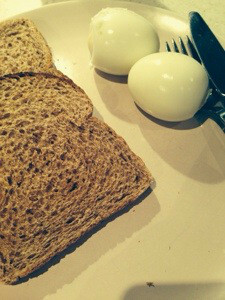 Okay, so we know that eggs are packed with essential proteins needed to help build and tone muscles as well as keep trim. Something we hear is, "I eat eggs everyday, how can I make my eggs more interesting???" So we thought we would compile a few basic ideas and recipes to help. Please feel free to email your own to info@youpersonaltraining.com and we will publish them for you. 2 whole eggs, 4 egg whites, Olive Oil, Black pepper. On a very low heat, add a tea spoon of Olive Oil to a medium sized frying pan. Allow to heat for a minute. Crack your 2 whole eggs and four whites into the pan. Try keeping the two yolks on separate sides of the pan (the yolk is the tasty part so keep them spread out!). Using a spatula, keep going around the edges of the pan to separate the mixture from the base to avoid burning. When the base has cooked and turned white (around a minute), take the pan off the heat, add some black pepper and add a lid to the pan. Leave for around two minutes, the heat in the pan will allow gentle cooking your eggs. Before serving, check it is cooked and not 'snotty'. If it is snotty, whack the lid back on for a while longer. 2 whole eggs, 4 egg whites, Olive Oil, Tumeric powder, Black pepper. Showing 1 to 10 of 21 posts.